Bjorn Wharff (inset) in The Integrated Survivability Assessment Facility. Image via DST Group. 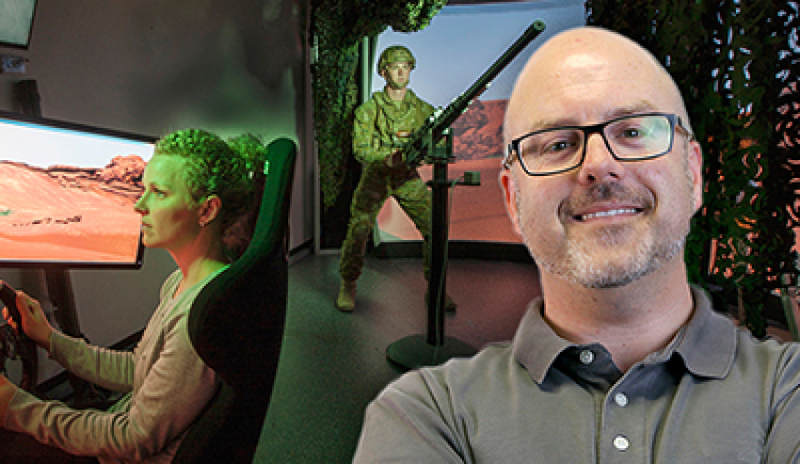 Defence Science and Technology (DST) Group's Integrated Survivability Assessment Facility (ISAF) and its interconnected Virtual Threat Lab (VTL) have recently installed a vehicle simulator to help support the Australian Defence Force's LAND 400 and similar projects. The ISAF measures the survivability of operational platforms, while the VTL offers different threats such as heavy machine guns, grenade launchers, and shoulder-launched and laser-guided missile systems. These are modelled using life-like physical props and validated munition models. The systems can be used by human operators or scripted to engage platforms in the ISAF or from elsewhere. In order to understand the survivability of a platform, Defence scientist Bjorn Wharff and his colleagues at DST Group scrutinise the target platform. The team look at on-board sensors, consider priority threats that might engage the platform and assess countermeasure systems (such as threat warnings and flares) that form part of the platform's self-protection suite. "Then we can add in the human," says Wharff. "The human element may not always be relevant but it is for specific kinds of experimentation such as situational awareness effectiveness and tactics analysis." Wharff said the Australian Defence Force wants to know what the best course of action is once a platform is shot at. "We have conducted trials using ARH Tiger and MRH-90 (helicopter) pilots in the ISAF where we have been able to assess platform sub-system performance and evasive manoeuvres against artillery threats," Wharff said. "Afterwards we have been able to derive results and report on the effectiveness of different elements such as threat warning, situation awareness (visual, aural and tactile) and manoeuvres. The new vehicle simulator at the VTL will now enable scientists and army tacticians to understand how best to counter anti-tank weapons such as laser-guided missiles. In recent times, Wharff said his team has been revising the ISAF architecture so scientists and military operators can access the facilities remotely, using a new tool. "That's where Mozart, our new dedicated scenario planning tool, comes into play," says Wharff. Researchers can use Mozart to design any engagement that they are interested in, place a helicopter here and a threat there, and the system will automatically go and manage all the infrastructure required, run the job and return the results using the highest confidence inputs available. "Automating the entire work flow has never been done before using a distributed simulation infrastructure, and we've done it," explains Wharff. "At the end of the day, the ISAF is about providing Defence personnel with a tool to analyse how well their platform will perform against various realistic threats."